When Shaimaa Houri Zada, a 14-year-old Chartiers Valley High School student, limped into her ninth-grade art class, her skin was flushed and bruises had begun to form across her neck and face. Just a few minutes earlier, on Friday, December 14, 2018, she stopped to use the restroom between classes. She was ambushed there: confronted, punched, and kicked in a bathroom stall. She thought the aftermath would be the same as usual — that no one would notice that she’d been brutalized by fellow students outside her teachers’ watch. “I just went back to class,” Shaimaa said in an interview with Postindustrial, publicly describing the attack for the first time. This wasn’t new to her. She had been so badly bullied at her previous high school — Carlynton High School in Carnegie, Pennsylvania — that she transferred to Chartiers to escape. She reported the comments to teachers, she said, but teachers often didn’t know how to deal with the teasing, the bullying. Administrators would send her, sometimes twice per day, to the principal’s office. She didn’t understand why, and the attention only brought more teasing from her classmates. And then there were incidents like this one. “I thought no one was going to do anything, like always,” she said. Instead, the teacher asked her what happened, and after Shaimaa explained, the teacher called the principal to the classroom, who then alerted her parents. As she awaited their arrival, standing with a school resource officer outside the school entrance, Shaimaa fainted. The school resource officer called an ambulance, and she woke up in the Children’s Hospital of Pittsburgh, where she would spend two nights. She’d sustained severe bruises across her face in the attack, along with a concussion that would lead to more doctor’s appointments, and a neck injury that required a brace. She had been a student at Chartiers Valley for two months. 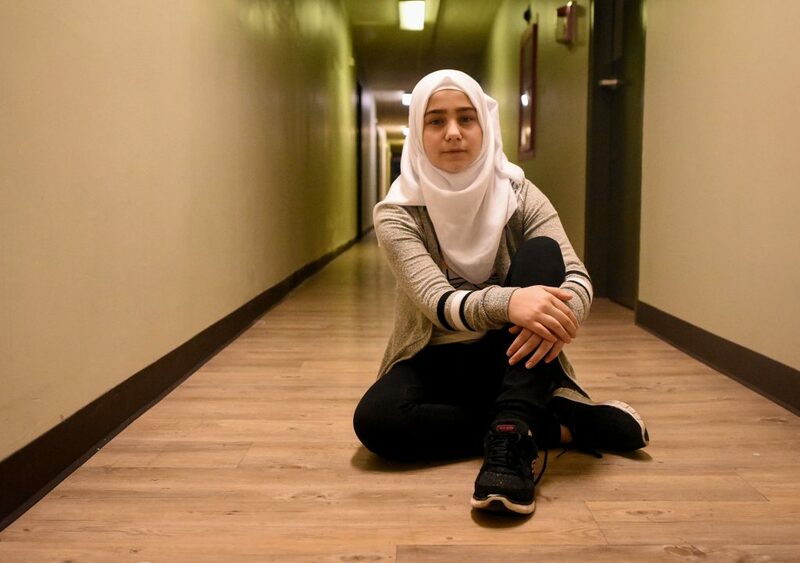 Shaimaa and her family had been living in Pittsburgh as Syrian refugees for almost a year and a half. They didn’t realize that a video of the attack would soon go viral, broadcasting their family’s pain, experience, and story to the world. The next day, a Saturday, a cell phone video posted to Facebook laid bare the explicit details. Shaimaa emerged from a dark blue bathroom stall as a tall white girl with blonde hair in a purple shirt confronted her, saying, “Oh, I can do that. You don’t think I can do it?” It’s unclear what she was referring to. She interrogated Shaimaa, hands on hips, while Shaimaa — bewildered and holding a plastic Coke bottle — responded with her hands by her side. After a few more verbal exchanges, at 22 seconds in, purple shirt shoved Shaimaa. Shaimaa pushed back. Shaimaa’s backpack fell to the ground and her drink dropped from her hand. Purple shirt unleashed a barrage of punches at Shaimaa, who soon hit the ground next to the toilet. “Leave me alone,” Shaimaa yelled repeatedly. The barrage continued. Shaimaa, flailing, tried to cover her head with her arms. Purple shirt held Shaimaa’s jacket and shoulder with her left hand, and punched Shaimaa’s head with her right hand. Shaimaa stood up. She didn’t cry. Purple shirt began to walk away, but when Shaimaa responded inaudibly, purple shirt turned back around to face Shaimaa. The camera shook, cut to the bathroom door. The video stopped after 58 seconds. Alexis Work, a senior a Chartiers Valley, initially posted the video to Facebook after the alleged attackers shared the video with fellow high schoolers. It soon caught on — understandably so. where thousands of people reacted in comments and shares. The current political climate has intensified bullying in schools. An analysis from Education Week and ProPublica for a project called “Hate in Schools” showed the largest number of hate crimes reported in a single day in K-12 schools happened on November 9, 2016, the day after the presidential election. And a statewide bullying survey administered in Virginia schools showed that, in 2015, the bullying rates between areas that voted for Hillary Clinton versus Donald Trump were not very different, but in 2017, students reported 18 percent more bullying in Virginia locales that ended up supporting Trump; in the Clinton areas, the bullying declined slightly. To date, the video has been shared 1,469 times, and the original footage viewed roughly 138,000 times. Other reposts have garnered millions of views over the past month, and the attack has been reported on internationally, particularly in Middle Eastern countries. As the video ignited controversy across the country, Shaimaa and her family watched, publicly silent and privately overwhelmed. They did not expect behavior like this in the land they came to as refugees. When Shaimaa’s father, 52-year-old Abdulkafi Houri Zada, learned that his family’s application for refugee status with the United Nations was accepted in the United States, he picked Pennsylvania. He’d heard that the region was beautiful, that healthcare resources were good, and that the school systems were academically rigorous. The family fled their home city Homs, where significant and violent urban fighting began in 2011, to stay in Damascus for three months before moving to Egypt, where they spent the first two years in a refugee camp, and then another two in Cairo. It was there that they applied for refugee status, and after it was granted in August 2016, they moved to the United States. When applying for refugee protection, you are only allowed to relocate once your application is approved, meaning that applicants may have to wait for extended stretches in dangerous locations. After fleeing war for five years, they were excited at the prospect, finally, of peace. Shaimaa, her parents, and six other siblings lived in the Khaldiyeih neighborhood of Homs in a home that held many generations of their family. After peaceful civilian uprisings were met with government force, the war escalated quickly, and soon, cities became battlegrounds. People were starting to disappear; two of Shaimaa’s cousins, girls who worked at the local hospital, went missing, and to this day, no one knows where they went or who took them. Many families left before Shaimaa’s did, but Fatima Alasam, 46, Shaimaa’s mother, said that the main thing that kept them there was hope that the fighting would come to a quick, peaceful end. It was when they began to see children being kidnapped and killed that they went into hiding. Civilians came from other countries — Afghanistan, Lebanon, Russia, more — to join the escalating conflict, and shortly after, soldiers and fighters were surrounding their house. The entire family stayed in their basement bunker for a month and a half — “It was really scary,” Shaimaa said. “We couldn’t open any lights, we couldn’t talk because then they would know where we were. We were scared all the time.” — before Abdulkafi had a chance to move his family out. “We were living as kings in our country. What happened, the war, was god’s will,” Abdulkafi said. They escaped their basement and stayed in a farmhouse outside the city for 10 days. During a lull in the bombing, the family fled to Damascus in a truck. Seven family members, all children, sat in the open air in the back of the truck. They spent the two-hour drive listening to bombs fall in the rain, terrified as they passed through military checkpoints at the intersections. They knew that sometimes, if people didn’t follow regulations, the adults would be taken away and the children left in the car. “If you don’t stop, they just shoot you,” Shaimaa said. Shaimaa’s second youngest sister cried the whole ride, missing her toy building blocks that had to be left behind in the minutes they had to get to the car. But when asked what Shaimaa remembers of the ride, she said it’s hard to remember the details — her concussion from the incident at school affected her memory recall. One thing she’ll never forget: seeing her brother’s friend die in front of their house. He was walking down the street when he was shot. Military and civilian fighters were on either side of the street, and Shaimaa and her siblings watched from a window in their building. And it wasn’t the only time it happened. In the moments before the video started, Shaimaa said, the girl in the purple shirt banged on the door of the bathroom stall and demanded to know if it was Shaimaa in the stall. Shaimaa was not sure why the two girls were asking about her. (It was misreported by a number of news sites, according to Shaimaa, that purple shirt wanted to vape and Shaimaa told her not to.) Shaimaa had had a previous verbal altercation with the girl in the purple shirt that scared her. Another girl had already started filming with a cell phone when Shaimaa emerged from the stall. The attack, captured on video, commenced. A second round of punches followed, Shaimaa said — one that wasn’t recorded. “After the video ends, she came back and started beating me up again,” Shaimaa said. Then the girls left, leaving Shaimaa alone to calm herself and, shocked and numb, walk to class. Chartiers Valley School District spokesperson Mikaela Duckstein said in a statement that “consequences will be enforced to the fullest extent, according to district policy and the law.” Duckstein said that this incident was not a “true indication” of the student body, and that the school will continue hosting its “No Place for Hate” events to educate students and staff on tolerance, acceptance, and kindness, in partnership with the Anti-Defamation League. Shaimaa hasn’t returned to school since her hospitalization. Police in Collier Township — where Chartiers is situated — charged Shaimaa’s accused attacker with one count each of aggravated assault, harassment, and disorderly conduct, according to a statement issued on December 21. WTAE later reported that Collier Township police charged the girl who filmed the incident with two felony counts of violating the Pennsylvania wiretapping law. Investigators with the Allegheny County District Attorney’s office concluded that “evidence in this case does not support” an ethnic intimidation charge, according the the Collier Township statement. Safdar Khwaja, president of the Pittsburgh branch of the Council on American-Islamic Relations (CAIR) Executive Committee and CAIR-Pennsylvania board vice chair, questioned that conclusion. A few days after the attack, CAIR-Pittsburgh offered legal support to Shaimaa’s family and called on state and federal law enforcement to investigate the motive for the attack. Khwaja explained that hate crimes against Muslims happen often, and are on the rise. Hate crimes often go unreported, he said, alluding to how often these incidents occur and how often they go unpunished. This can be due to a distrust of police authorities, a fear of being seen as a tattletale and the trouble or stigmatization that comes with that, or a lack of access to the proper reporting channels. Wasi Mohamed, executive director of the Islamic Center of Pittsburgh, fields many personal reports from Muslims who have experienced hate crimes but not reported it to officials. Shaimaa’s mother, Fatima, explained that her biggest fear in relocating to the U.S. was that her children would be kidnapped or hurt in this foreign country. But the family did not expect the bullying. They said Shaimaa would come home from school, crying and upset, pleading to not go back. “We ran away from terrorism to find another kind of terrorism here,” Fatima said. Khaled Houri Zada, 20, Shaimaa’s older brother, has faced his share of harassment, too, with comments made about his ethnicity and religion and pointed questions about whether he is a part of the Islamic State group. Shaimaa’s house in Homs has been reduced to rubble. A video taken by a family member showed a layer of debris, plaster, broken furniture, and chunks of the walls scattered on the ground; the sections that remain upright are sprayed with bullet holes. But when Shaimaa compares Homs to Pittsburgh, she finds the kind of fighting she has to do here is harder. Shaimaa has not watched the video of the attack. At first, she didn’t want to talk or think about what happened at all. Like any teen facing undue attention, she was initially embarrassed and didn’t want people to think she wanted the video posted just for the social media celebrity. That feeling has passed, and she wants people to see the video and learn what bullying can look like. 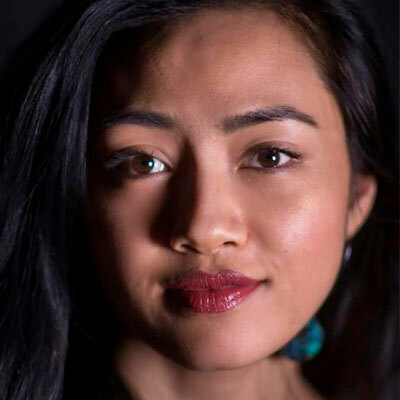 Shaimaa’s determination to learn how to stand up for herself has been tested, repeatedly, but she also questions why this harassment takes place at all. “I think about it, why does it have to be me?” she asked. She paused. She knew it was because of her hijab. Education Week and ProPublica collaborated on a project called Documenting Hate: Hate in Schools to explore how students have observed hate crimes in school settings. The Council on American-Islamic Relations released a report that describes and clarifies the hate crimes Muslims experienced in 2018, and compares the data to previous years. A Pittsburgh Post-Gazette column considers the viral nature of the Chartiers Valley High School video, and how that led to and perpetuated a misunderstanding of the attack. Michelle Goldbert, columnist for The New York Times, analyzes a Virginia report that identified a correlation between middle schools that have experienced an 18% increase in bullying since Donald Trump was elected, and districts that voted for Trump. Read that report here. Slate takes a deeper look at the FBI hate crime numbers and provides more context to the truth behind those numbers and how they really are rising and falling.